This light fixture is beautiful, well-made, packed very nicely will all the hardware needed. And, you can't beat the price. Highly recommended. 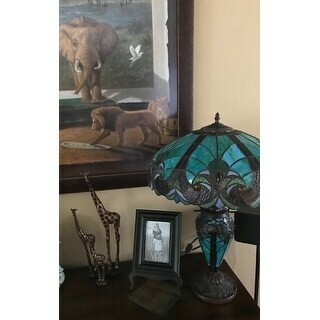 Hand-crafted with over 475 hand-cut pieces of art glass, this beautiful stained glass table lamp is double lit between the base and the shade. This elegant design features curving patterns in rich colors to illuminate your home exquisitely. Requires: Two (2) 60-watt max medium base bulbs and One (1) 15-watt candelabra bulb in base (Not Included). Fixture Dimensions: 24.75 inches high x 18 inch diameter. I was really worried about all the reviews about plastic, but the lamp is made of stained glass. The description is correct, "400 hand-cut pieces of bent glass in this Chloe light table lamp." The main colored glass is striated and is called art glass in the stained glass supply stores. it is beautiful when lit up, but it is also very pretty in front of a sunny window, when the sun hits it, the bottom 3 inches of the shade shimmer like a border. 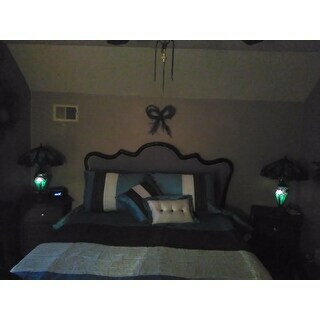 They mention variations in color among lamps, but mine, when lit, looks more aqua/green with a few pieces of turquoise. But when not lit looks turquoise. The border around the bottom of the shade is smoky lavender with pale lavender insets. The only thing that is a little crude is what looks like a bent wire decor piece at the top of the base near the pull chains. It's more like a bent piece of metal rod, and the ends are just chopped off, somewhat indelicate compared to the delicacy of the rest of the lamp. And mine didn't have the 7 watt candelabra bulb, so I'll have to disassemble it after purchasing one. But it is a lovely lamp, it glows beautifully..
Unforetunately, this lamp's shade and "glass" aren't glass, rather some heavy plastic or resin. Should have known by the price because I got a smaller one many years ago from Overstock for close to the same price. It looks OK in the daytime if you don't touch it, but at night looks pretty cheap. I love this lamp... It came securely packaged. The colors are true to the picture. 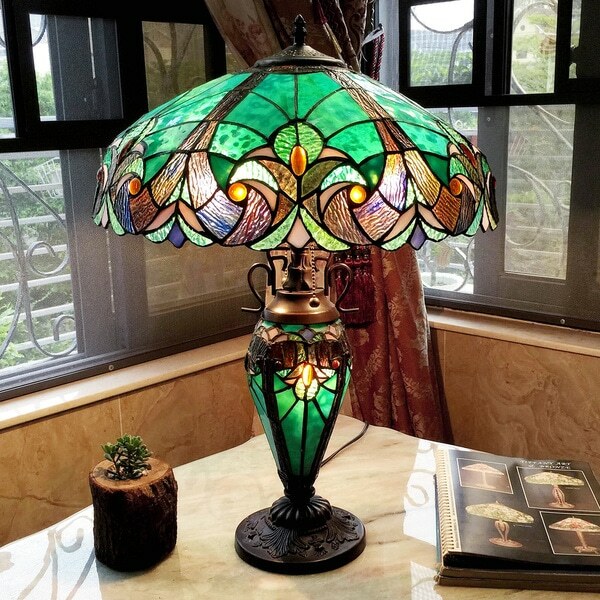 I noticed some buyers complained about the " glass" well if they really read the description and reviews they would have seen that the glass is " Art glass" unless you are buying a real Tiffany lamp with real glass costing bukoo $$$ this is how these lamps are made. It was so easy to put together and I love the night light as well. And the option to turn off the main lights with just the night light on is great. The price was excellent . With that said I am completely thrilled and happy with this light !! So again, always read the description fully as well as reviews, and i'm positive with some reviewers they will always find something wrong with much of what they buy. Don't let that throw you off, the bigger picture in reviews is almost all of the people are happy with their purchase ! And overstock is the best. I have NEVER had a problem with them ! The lamp is as described. Different reviews I read were pretty much correct. I bought it for my bedroom. Not so much to use as a lamp but just as a decoration. I have it sitting on a dresser centered in front of a mirror. It makes for a beautiful display with family pictures sitting around it on the dresser. I basically use the bottom portion that works well as a night light. I don't have it on to use as a night light but simply because it is pretty giving a nice gentle glow. I have not used the top shade much as I need to get some 40-watt led bulbs. My 60-watt bulbs cause the lamp to shine beautifully but as I am disabled lying in bed most of the time I can see the bulbs under the shade as the lampshade is 2' higher than my head. (see photo) This is not an issue with the lamp. I want to leave the lamp on continually. Four 60-watt bulbs on continually will be a waste of electricity and money. I am extremely happy and satisfied with this lamp. These are stained glass lamps. I did it for 22 years. People would tap on it and think it was plastic but I always say, you can't solder plastic. When you have small pieces of glass soldered together it sometimes fools people but believe me, you cut up 2 x 4 sheets of glass to get all those pieces and it is a time consuming job. I couldn't sell the ones I made for the price they are here. 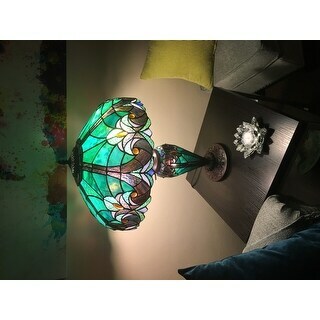 this stained glass table lamp is a great addition to my living room. A piece of artwork. I received my order within 3 days. 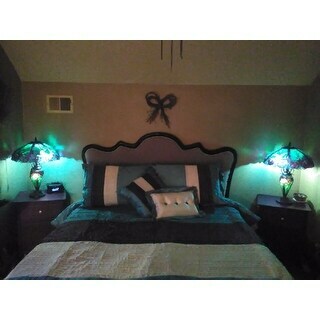 These are the colors I wanted in my room. This lamp is beautiful even before It was lit!. 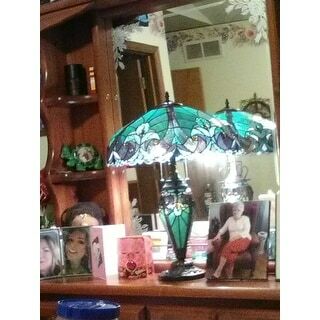 It replaced a real Tiffany lamp my Mom-in-law had but gave away. I like mine better. It is lighter than the other on top so I do not need to worry about it tipping over. I have read that it is made of plastic and people were disappointed in that, but I tap my finger on it and it 'sounds' like glass so if it is plastic, it is some new wonderful plastic and I can really appreciate it for it's price! I am sure an expert can tell me how it is different from a Tiffany, but I do not have many experts checking out my furnishings. After all, it's just a lamp, a beautiful one at that, and I did not need to break in to the tuition money to purchase it. I am very pleased. This was a splurge purchase for me. I promised myself that if I earned a certain amount of money in a given quarter I could buy it. I am SO happy I did because it is a constant joy to me. The colors are lovely, dominated by a rich teal with accents of gold, blue, purple and very pale pink. The glass variations -- milky, clear, textured -- add a lot of visual interest, as does the beautifully detailed bronze-tone base which is lit from the inside. This lamp goes on when I enter the room, and stays on until I'm ready to go to bed. It has given me as much pleasure as the small stained glass dragonfly lamp I bought years ago for substantially more money. Yes, some of the lamps you'll find here look cheap when you get them home, I won't lie to you. But this one looks as if you paid a whole lot more for it than you will. Don't hesitate. This lamp will make you happy. There was only one thing wrong with this lamp - the panes had bubbles in them. The panes are plastic, not glass, which is why this lamp is so inexpensive. I decided not to continue returning it until I got a good one. The colors are very pretty. However, the shade has large spots that look like water was splashed on the shade in the preparation process; naturally these flaws are highlighted when the lamp is on. I have Tiffany style lamps in every room of my house, and none of them have this type of flaw. Another disappointment: The packaging. My gosh...leave a little room to get the thing out of the box. It took me 30 minutes and three tries to get the shade out. Frankly if it hadn't been so hard to get out of the box, I would probably put the lamp right back in and return it. My Overstock experiences have been fair to poor, come to think of it. Guess I'll go look elsewhere for my purchases from now on. Get this lamp! It’s really beautiful! These are absolutely beautiful. My girlfriend loved them. They look great in her bedroom. Oh. My. Gosh. Absolutely gorgeous. This lamp is out of this world!!! These are the perfect colors for my little nook in my office. The lamps sits on the credenza next to a chair reupholstered in same color and is below to the right of 3 mosaic plates hanging on the wall in turquoise and black. I am in the office now at 4:00 AM and can't stop looking at the beauty of this lamp with all 3 lights on!!!!! Love it! Beautiful!!! Does not give off much light but is so gorgeous when it's on. I get so many compliments on them (I have two). Would definitely recommend. Looks great without paying a huge price for an "original" lamp. I love the colors. It is a beautiful lamp and bigger than I thought it would be. The only draw back is, to turn the base light off, you shut the entire light off. Beautiful light...the colors, the quality, the looks of it. It is a nice size and looks very expensive. I like the 2 bulbs to double light it and the base lights up. Very happy with this purchase. 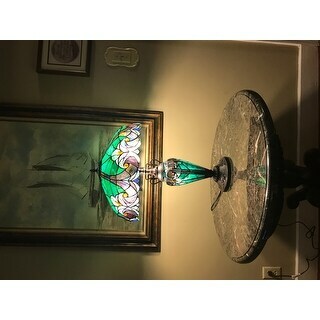 Very beautiful lamp and well worth the purchase - I really enjoy the lighted base as well - I highly recommend it! "The reviews are very mixed. What is the answer about what light bulbs it takes. It states 100 watts and the customers are saying that's not true. 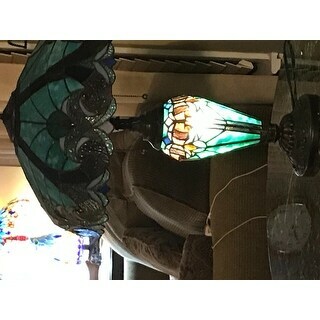 Also is there a way I can read current reviews Do you have a matching floor lamp"
I have two Ecosmart CFL bulbs (they look like curliques) in my turquoise Tiffany style lamp that use 15 Watts each but give 60 Watts worth of light and are cool. There is also an LED version of the bulbs that give 60 Watts worth of light, but only use 4 Watts. They are expensive, but last a very long time. I put a night light bulb in the base, which uses 4 Watts. "is the lamp made of glass or resin? Is the base from metal or bronze or resin. I have 2 tiffanys"
"I love the 2 light tiffany y Halston lamp but 18"wide is a bit large for bedside table. Does it come smaller?" It doesn't look like it, but there's a similar one, ITEM# 14493825. I'm using them as bedside table lamps, and I think they're perfect. "What is the main color of the lamp?" Hello kristine0304, this item features turquoise and amber art glass and a dark antique bronze finish base. Please feel free to contact us again with any further questions. Thank you for shopping with us! "is this lamp final sale ?? or we can return it ?" Hello alijoya, this item can be returned. Please see the following link for our return policy ( https://help.overstock.com/app/answers/detail/a_id/1387?TID=FOOT:CS:HOLIDAYRETURNPOLICY). Thanks for shopping with us! "What guarantee is there that the lamp is made of real glass, not plastic?" Hello Dolphin75, we appreciate your inquiry. Overstock stands behind each of our items and authenticity. Thank you for shopping with us. "Why is this label on the lamp - see below - Attention California residents: This product contains lead, a chemical known to the state of California to cause cancer and birth defects or other reproductive harm. Thanks"
Hello Pearly, I believe they use lead solder to secure the pieces of glass to the shade. Thank you for shopping with us.